Celebrate the fall season with friends and family sharing this sweet & savory vegan side dish! Full of caramelized flavor and hint of cinnamon and orange! Preheat oven to 425 degrees F. Line a rimmed baking sheet with parchment paper, a silpat, or lightly grease with oil. Prep veggies: Cut ends off butternut squash, and peel (a vegetable peeler works great). Slice butternut squash in half lengthwise, scoop out seeds, and dice into 1/2 inch cubes. Trim the bottom of the brussels sprouts and slice them in half lengthwise. If brussels sprouts are on the larger side, quarter them instead. Roast: Place the brussels sprouts and squash on the baking sheet, drizzle with a little oil, and toss to coat. Arrange the vegetables in a single layer, making sure the brussels sprouts are cut side down. Sprinkle with salt. Place the baking sheet in the oven and roast for 40 minutes, stirring after 25 minutes. About 5 minutes before removing the vegetables, add the cranberries and pecans to the baking sheet. Remove and let cool slightly. Dressing: In a small bowl, squeeze the juice from 1/2 orange and add a generous dash of cinnamon, mix well. 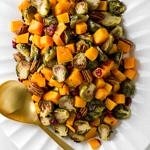 Assemble: In a large mixing bowl, add the roasted vegetables along with the orange-cinnamon dressing. Add salt and freshly cracked pepper to taste. The cinnamon is subtle here, add more as desired. Transfer to serving dish. Enjoy warm, at room temp or chilled. Vary the recipe by replacing the cranberries with pomegranate seeds.